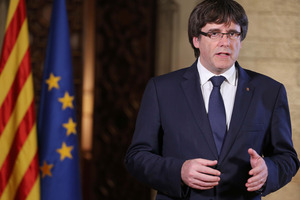 Following Prime Minister Rajoy’s invocation of Article 155 of the Spanish constitution to remove Carles Puigdemont and the Executive Council from office, the President announced that he would ask Parliament to convoke a plenary session to “debate and decide on this attempt to abolish our self-government and our democracy, and act accordingly”. In an Official Statement, President Puigdemont criticized that all of the Catalan Government’s proposals for dialogue “have had the same answer: either silence or repression”. “What the Catalans decided in the polls the Spanish government abolishes in lawsuits”, he affirmed. In this regard, the President denounced that the Spanish government, “with the support of the Socialist Party and Ciudadanos, has embarked on the worst attack on Catalonia’s institutions and the Catalan people since the decrees of the military dictator Francisco Franco”. The same decrees which “abolished the Generalitat”, he noted. According to Puigdemont, the Generalitat “is not an institution that was born with the current Spanish constitution”. Its long-standing history was restored based on its “historical legitimacy and the continuity that presidents Companys, Irla and Tarradellas ensured while in exile”. “The Catalan institutions and the people of Catalonia cannot accept this attack”, the President stated, assuring that the measures intended by the Rajoy Administration are “incompatible with a democratic attitude and reside outside the rule of law”. “Because imposing a form of government not chosen by the citizens and without a parliamentary majority is incompatible with the rule of law”, he added. The President also conveyed a message to the democratic people of Spain in which he underlined that what is being done to Catalonia is “a direct attack on democracy” and it “opens the door to other abuses”. In addressing the European community as a whole, Carles Puigdemont warned that “if the EU's foundational values are at risk in Catalonia, they will also be at risk in Europe”. “Democratically deciding the future of a nation is not a crime. This goes against the foundations that unite European citizens through their diversity”, the President asserted in his concluding remarks. In attachment is the President’s Official Statement translated into English.